Through her work in the National Oceanic and Atmospheric Administration (NOAA), Evelyn J. Fields has broken barriers for women, African Americans, and African American women. Born January 29, 1949 in Norfolk, Virginia, Fields attended Booker T. Washington High School and then graduated from Norfolk State College in 1971 with a mathematicsdegree. In 1972, Fields took a job as a cartographer for NOAA in Norfolk; however, in 1973, when the NOAA Corps began recruiting women, Fields became the first African American woman to join this corps, which is a uniformed service separate from the other military branches. Fields’ 23-year career with NOAA has included many jobs. She served on many NOAA ships including Mt. Mitchell and Peirce, and held the executive officer position on Rainierwhile carrying out research on these hydrographic survey vessels. Fields rose in rank with the Hydrographic Survey Division, serving as chief, and as the administrative officer for the National Geodetic Survey. In 1998, NOAA selected Fields as the first woman to command a federal ship when she became commanding officer of the McArthur, a research vessel for oceanography and fisheries. This promotion also marked the first time an African American woman was given the responsibility of commanding a U.S. uniformed services’ ship for any extended duration. In 1995, Fields became Director of the Commissioned Personnel Center in Silver Spring, Maryland. Two years later she became the deputy director of the National Ocean Services in 1997. In 1999 President Bill Clinton appointed Fields the Director of the NOAA Corps which came with a simultaneous promotion to Rear Admiral of the NOAA Corps. She was the first woman and the first African American to serve as Director of NOAA and the first to hold the rank of Rear Admiral. 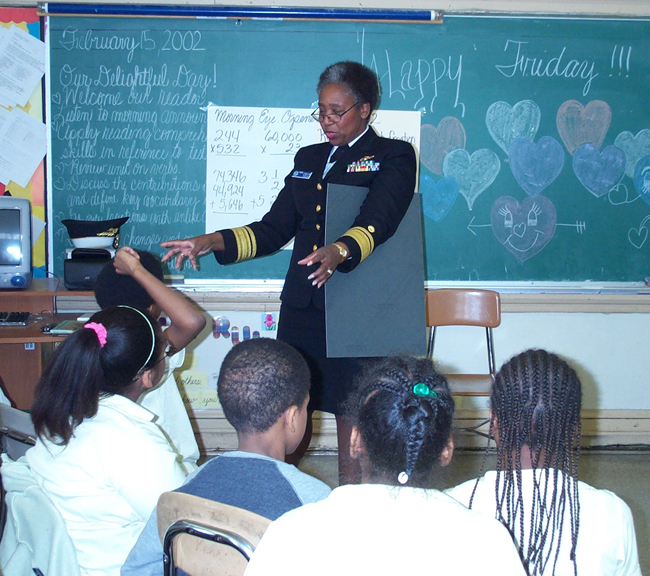 Highly regarded for her accomplishments, Admiral Fields has been given the Bachelor-Benedict Club’s Lady of the Year Award in Norfolk, Virginia in 1994. In 1996 she was named by the National Technical Association as one of the top 50 minority women in the science and engineering fields. In 1999, Fields was given the Congressional Black Caucus’ Ralph M. Metcalfe Health, Education and Science Award and Woman of the Year from Maryland Federation of Business and Professional Women’s Club. Additionally, for her leadership, Fields received a Gold Medal from the U.S. Department of Commerce (2000). Later that year the Virginia Legislature created a joint memorial resolution which honors her work in and for the city of Norfolk. Admiral Fields retired from NOAA in 2002 and has homes in both Florida and Maryland. Catherine Reef, A to Z of African Americans: African Americans in the Military (New York: Facts On File Inc., 2004); “Senate Confirms Capt. Evelyn Fields as Director of NOAA Corps; Fields Promoted to Rear Admiral” http://www.noaanews.noaa.gov/stories/s183.htm; Denise Watson, “Norfolk’s Evelyn J. Fields: Innovator for NOAA’s Research Fleet” https://pilotonline.com/guides/african-american-today/article_24158fba-2224-53e6-8276-a9b271edd726.html; “Evelyn Fields: A Career of ‘Firsts’” https://celebrating200years.noaa.gov/transformations/corps/side.html.